☞ In an earlier post, where I quoted from an article titled “Narrative as scaffolding” on this blog, Phlip Zack argues that political perception cannot be immediate, as perception itself is mediated by narratives. I also mentioned that in the previous American Presidential election, Obama understood the importance of storytelling, and made good use of it in his campaign. Romney, as a contrast, did not, and in fact criticised Obama for believing that he should have engaged the people better through more effective storytelling in his first term as President (see Romney, RNC react to Obama’s comments on his biggest mistake). Romney’s failure to devise an effective narrative for himself was one of several factors that eventually led to his defeat. But would a future Republican Presidential candidate have a more effective story (or set of stories) to help him in his campaign? Jon Ward thinks that there is one, in the person of Marco Rubio, who, like Obama, appreciates the power of narrative in political engagement. 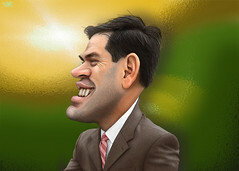 “Let us count the ways that Sen. Marco Rubio is already better positioned to be a competitive presidential candidate in 2016 than Mitt Romney ever was. Rubio (R-Fla.) is younger. He’s Latino. He gives a good speech. But less remarked upon: Rubio understands the importance of talking about himself. In other words, Rubio, 41, gets narrative. For much of the last year, the Republican Party apparently did not. And the GOP’s self-examination in the wake of Romney’s loss has prompted many to say that the party needs to convey a more compelling, inspiring vision to American voters. “The number one rule of competitive politics [is that] your story has to be rooted in lives of people. Having a narrative is really important,” said former president Bill Clinton. Obama now has strong public support in the fiscal crisis faceoff. Even as the House Republicans scramble to find a way into the argument, the president has a tight grip on the storyline. But now the president has a strong narrative arc: He is the protagonist who will stand up for what he believes in, battling the odds. A dramatic character holds our attention based on what he wants—the “spine of a character” in a play is defined by a clear through-line of intention. For much of Obama’s first term, the American public — his audience — felt that he had lost his way. ☞ Obama certainly believed in narrative. In his second Presidential bid, he claimed that one of the faults of his first term was his inability to tell the appropriate stories effectively enough. This was a contrast to his challenger, Mitt Romney, who, until the later stages of his campaign, was less interested in narrative. The Obama team’s consistent interest in narrative was one of the likely factors that led to his victory at the polls. This article points to Obama’s increased use of narrative (in the more traditional sense) to project his public image.